Skye Nicholson is a rebellious teenage girl. She has been through too many foster homes to count and has never been in one for more than six months. Now comes the Chambers home. And even worse- they have stinky horses that she's forced to ride. Skye would rather do anything besides ride the big monsters. Well, until she meets Champ. Can the Chambers straighten Skye out before it's too late? Can Skye win the upcoming competition with her new best friend? Or will disaster strike first? Read the book to find out what happens!!!! This is personally my FAVORITE horse series. Although it's recommended for kids 10+. I just started reading them, and it is SUPER good! I recommend to horse crazy girls ages 10+ as well. All I can say is READ IT! I love these books! I have read and own every single one! I highly recommend these books! These are the best books. They are so cool and even have facts about horses in the back. I love this series. A good book for any girl who loves horses. My favorite book is the third book Southern Belle's Special Gift. Overall a good horse series. this book series is awesome, one of my best friends got the first three for me and now i am addicted. Keystone Stables is a series of 8 books. They are really good. The back of the first book says, Most people know Keystone Stables as a very special dude ranch. For thirteen-year-old Skye Nicholson, it is her last chance. With Skye's growing record of offenses, only the owners of Keystone, Tom and Eileen Chambers, can keep her from being sent to juvenile detention. Not that Skye feels grateful. 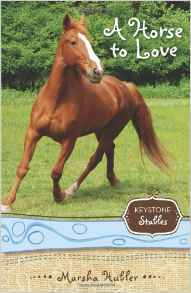 For her, Keystone is just another foster home like all the rest, except for one thing: Champ, a beautiful sorrel Quarter Horse who captivates Skye in a way she never expected. discoveries about God's love that can change the life of a troubled, lonely teen. I love this series! They are very vivid and descriptive. I highly recommend them. Skye Nicholson is now considered part of the Chamber family, even though she is still fostered. But Skye is overjoyed when her old friend Sooze. But Sooze brings new problems with her stubbornness. And when hard times come for Sooze and the Chambers, Sooze learns that friends are always there for you when you need them.